I love the sound of the word, “Lemon”. Just by listening to it, my mouth salivates immediately. I made a lemon custard almond cake the other day with a few lemons I had. 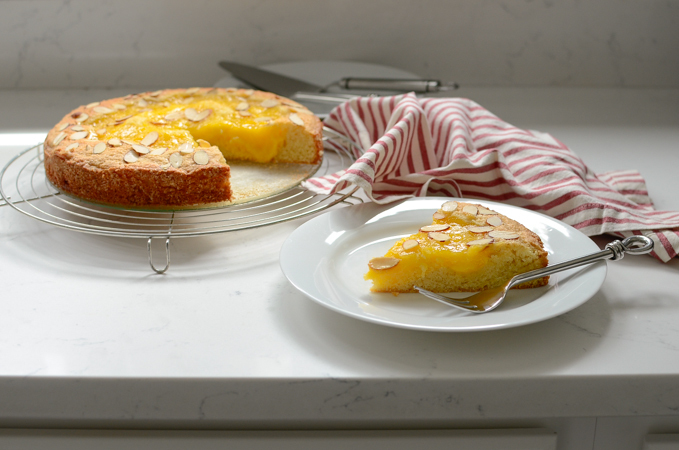 The lemon pairs very well with almond cake in the recipe. 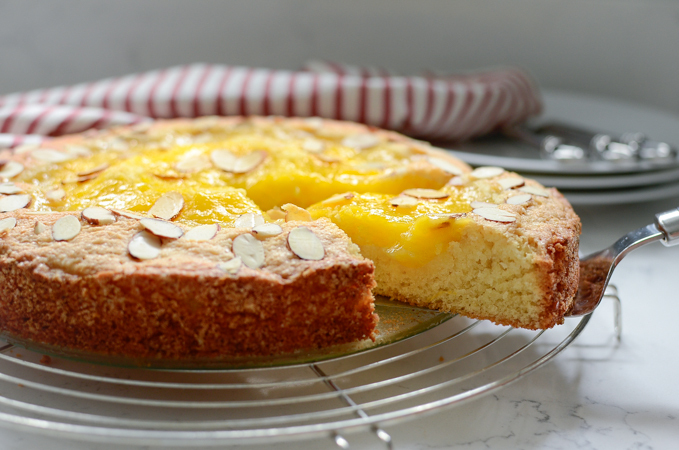 The custard is still wet and moist even after the baking time, and the almond cake yields soft and moist crumbs. It is like getting 2 for 1 in a cake form. I can picture serving this cake in many occasion in the spring time. 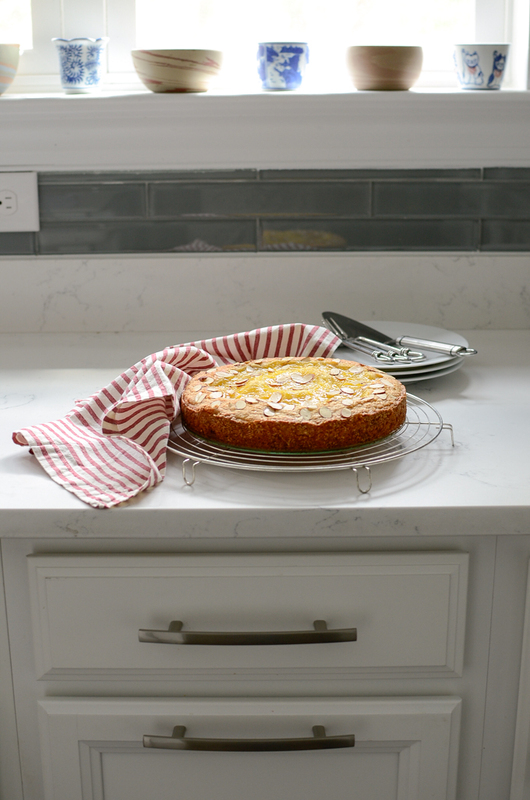 This lemon custard almond cake is really yummy cake if you like lemon. Making lemon custard is easier than you think. I just throw in eggs, sugar, and lemon zest in a pot and whisk together. Add butter and cook over medium low heat until it gets thickened. It took me about 5-6 minutes, I think. I transferred the custard into a bowl and cover the surface with a piece of plastic wrap to prevent the skin forming on top of the custard. Then, I chilled it for a couple of hours in the fridge. 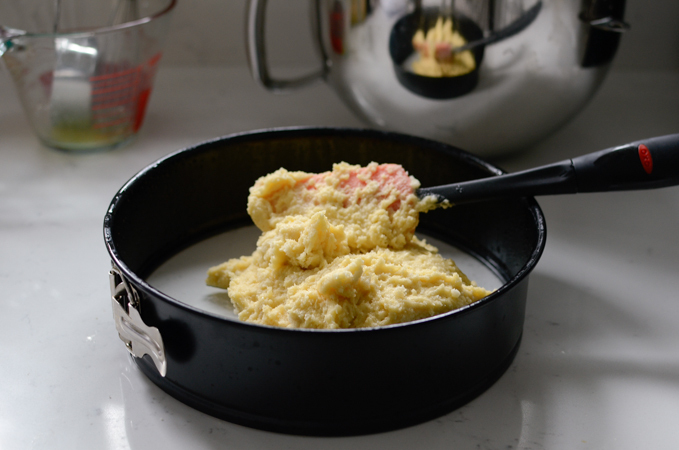 Almond cake batter is simple to make, too. I love almond flavor in the cake. Almond flour is easy to find in any stores these days. Just whip up together and spread on the spring pan. Spoon some of the lemon custard in the middle. I used about 2/3 of the custard and saved the rest for the toasts or other uses. I also sprinkled a little bit of almond flakes to give a nice look. Bake in 350 degree oven for 35 minutes. The custard is still wet and moist, and the cake is nicely browned. Love the intense yellow color of the custard. Cut a slice and enjoyed the labor. Yum~! I would say…, if life throws you a lemon? 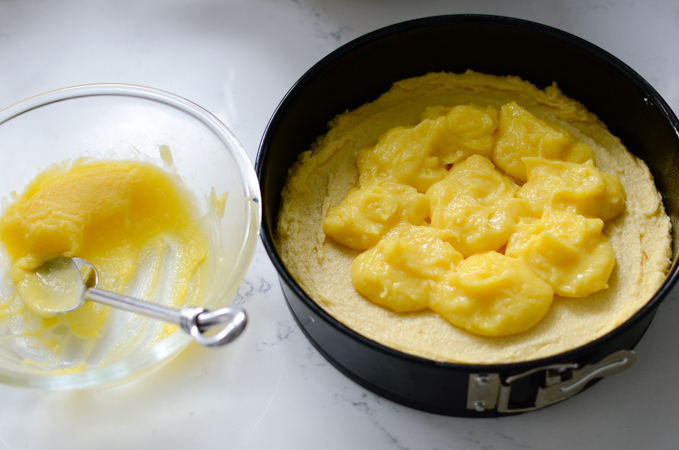 Make some custard and turn into a cake. So goooood~! 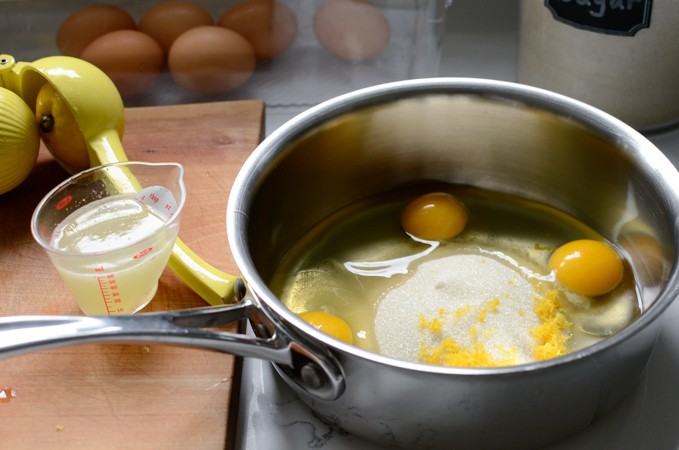 To make lemon custard, combine lemon juice, lemon zest, sugar, and eggs in a pot; whisk until everything is fully mixed. 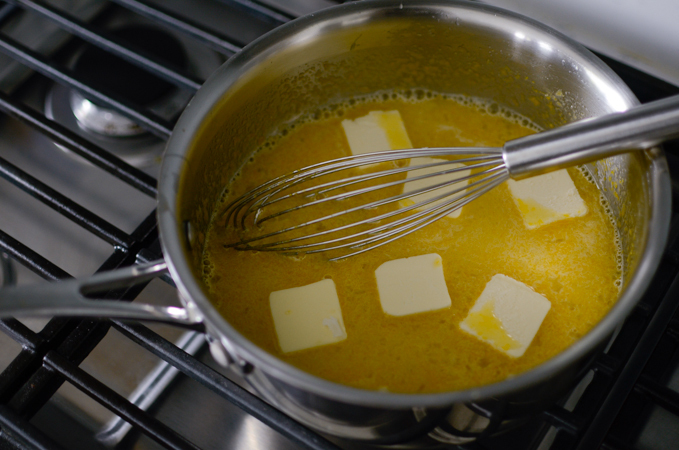 Place the pot over medium-low heat and add the butter. Whisk constantly about 5 minutes until it gets thickened. 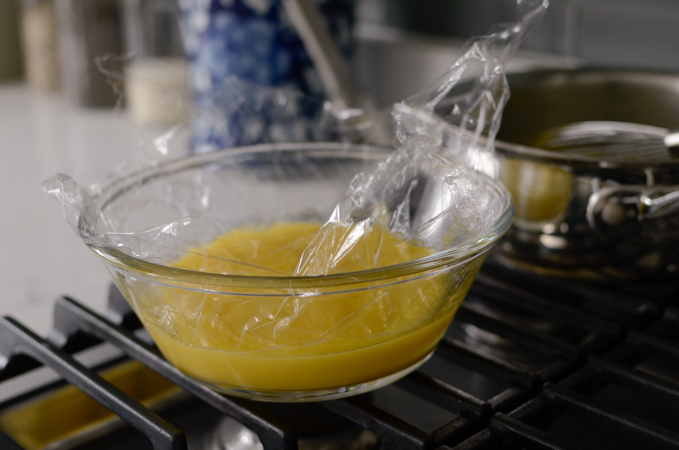 Transfer to the custard to a bowl and cover the surface with a piece of plastic wrap to prevent the skin forming. Chill in the fridge for at least 1 hour. To make the cake; preheat the oven to 350?F. Cream the butter and sugar. Sift together flour, baking powder, and salt, then add to the butter mixture; mix until combined. In a separate bowl, beat the eggs until it foams. Add in to the the batter, along with the almond flour, and almond extract. Stir everything until well mixed. Spread the batter into the bottom of 9-inch spring pan. Spoon the lemon custard on the middle of the batter, sprinkle almond flakes on top. Bake for 35 minutes or until the edges of cake turns golden brown. Cool the cake in the pan for 10 minutes, then remove it from the pan and cool completely. Although I really like chocolate (who doesn't? ), lemon is my favorite when it comes to desserts. Can't get enough of its flavor! I'd be in heaven with this -- SO nice. Thanks! I'm lemon first when it comes to desserts! 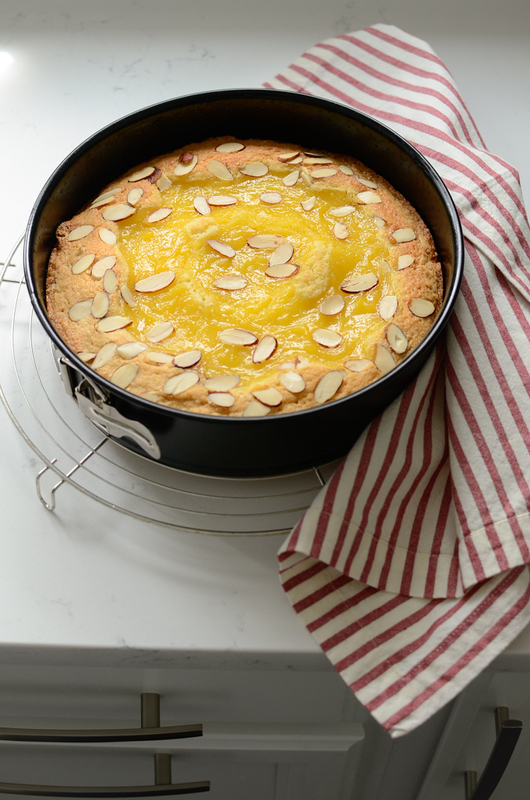 This custardy almond cake is fabulous! What a beautiful little cake. So perfect for spring. Thanks for sharing. I know that lemon is good for health, just wonder whether I can use the price cooker to make this cake.